If you are not already aware, my daughter Payton has just started her high school career and her Cross Country Career as well. You can read how her first races went by reading about her first 5k race (non-cross country) as well as her first 2 mile Time Trial as part of the Cross Country Team.This past Saturday was Brookwood High School Girls Cross Country's first 5k Time Trial of the official season. 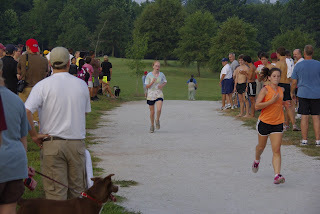 This race was run on one of their Cross Country Courses, the newest, at the new Alexander Park. The girls ran their race at 7:30 that Saturday morning. We arrived just before 7:00 to watch the boys cross country race and to give the girls a chance to warm up. The time to race came and Payton and the rest of the almost 100 girls lined up. Payton lined up about 3/4 of the way back in the pack and before I realized that she had done this they were taking off. If you read about her first 2 mile Time Trial you will realize that this is a bit further back than where she needed to start -- quite a bit! I mentioned to one of the other parents that I hope she pushed her way through the pack and didn't pace herself with the ones she started off with. The leaders appeared around the bend coming up to the 1 mile marker on this 3 circle course. I looked at my watch and saw they were pacing right around 6:30. I immediately started watching for Payton because in the 2 mile time trial she finished in a 7:04 pace. Right on time, at just before 7:00 minutes she crossed the 1 mile marker. I was happy to see that she had made her way through the pack and was right where she needed to be - now just to see if she could maintain it for the full 3.1 miles. The next mile came and went and based on where I was standing it looked like she crossed the second mile marker at about 14:08, still pacing right where she needed to be pacing. When she passed me at the start finish line I saw she was getting tired and I was worried she was going to start fading in the last mile. I waited intently and nervously as the clock started to near 21 minutes. I checked the time as she passed the 3 mile marker and it looked like she was still pacing around the 7 min pace with just .1 left to go. These three freshmen finished within just a few seconds of each other with Payton's time being an awesome 21:54, an incredible 7:02 pace! 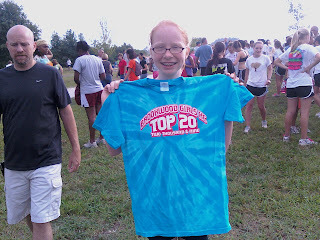 Payton finished in 10th place overall....... that is right, I said 10th place overall. There were a few runners that couldn't run the time trial and made it up a few days later. Overall there were right at 105 girls that ran the time trial which put Payton in 10th place out of 105 runners! I am very proud of her and am excited to watch her progress throughout the season. That's incredible! What a time and it looks like she is really enjoying the experience also. Great time! Sub20 is just around the corner. Top Ten is awesome! That is so great! 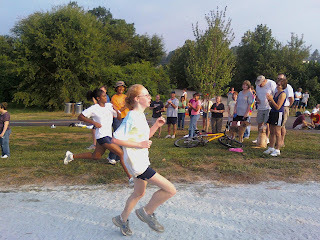 I bet you're getting a lot of joy out of seeing your little girl become such a great runner. Look out, I see sub-19's in the future! Smashes my PR out the ballpark as well. Congrats!